Messing About in Boats... and on Boards... and Jet Skis..
My front yard view -- how could I NOT get a boat? I first came to Traverse City to be near the water. That’s not surprising, I guess; so do thousands of other people. Water, after all, is what defines this place. It’s the beautiful backdrop for our family photos, the sparkling blue boundary to our beaches, the ever-changing spectacle that mesmerizes us at sunrise and sunset and all the hours in between. For a long time, though, the water’s edge was the boundary to my wanderings. Sure, you could swim and splash in it – but to venture out on its surface was another thing entirely. That was for people with boats, and I’d never owned a boat. I was a city boy, and I didn’t run in the kind of circles where people had boats. But you don’t live in Traverse City very long without getting a watercraft of some kind. In my neighborhood there are about as many old boats in people’s yards as old cars, so it wasn’t long before I started my own collection. And once that happened, I stopped thinking of the water as “forbidden territory” and began instead to see it as a big blue playground. I still think it’s awfully beautiful, but that’s really only half the story. Once you venture out on its shimmering surface, the water becomes more than part of the scenery. It becomes a highway to adventure. 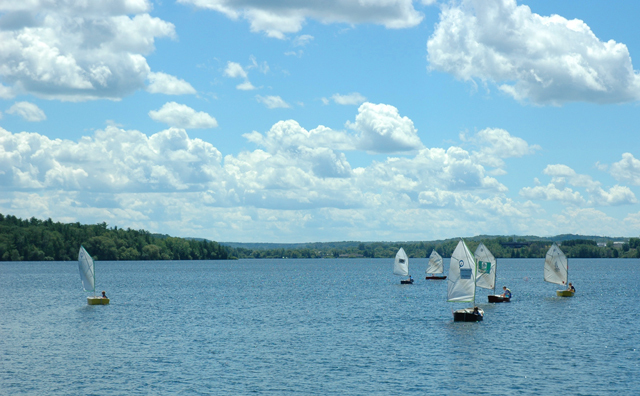 Here in Traverse City, local kids learn to sail on Boardman Lake in small boats called punts. With more than 150 inland lakes and hundreds of miles of Lake Michigan shoreline, Traverse City has always attracted active vacationers who enjoy interacting with water – whether that means sailing, boating, kayaking, fishing, or high-speed sports from waterskiing to kiteboarding. The reason? Grand Traverse Bay, a two-pronged “freshwater fjord” that’s sheltered on three sides from the wind and waves that can mae the open waters of Lake Michigan too intimidating for many novices. I discovered that sailing a tiny little boat requires that you be much more alert and responsive than sailing a larger craft. The added benefit is that you can do it all by yourself; my wife quickly tired of having me shout urgent commands at her in language she was never able to understand. But much as I love to sail – and I really, REALLY do – I found it a lot easier to get out on the water after we invested in a couple of kayaks. I love paddling effortlessly down a tree-shaded river without a care in the world, heading out along the East Bay bluffs to look for shipwrecks, or just matching my arms and shoulders against the wind and current. Most of our rivers are tame enough for novice paddlers, with just enough current to keep things interesting, and today’s kayaks are made for people of every age and aptitude. Just pack some sunscreen and a shore lunch -- and don’t forget your camera! 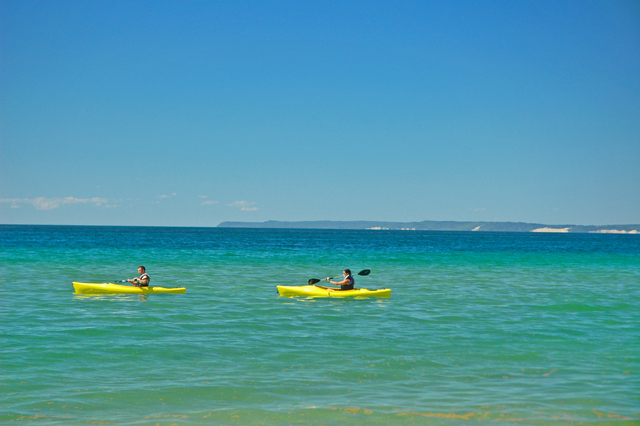 And there are lots of other ways to enjoy the water around Traverse City. Stand-up paddleboarding is one of the new fads on the local lakes and harbors; instead of sitting on a board, you stand up for great views of your surroundings, including the watery depths below. I’m not really into high speed on the water (or anywhere else, I guess) but lots of folks around here enjoy skipping over the deep on jet skis and other personal watercraft. Although they’re faster than ever, they’re a far cry from the noisy, smelly, uncomfortable machines I remember from 20 or 30 years ago -- more like small speedboats, and a useful way to get from one place to another in a hurry. Of course, the proliferation of all these boards and machines doesn’t mean there aren’t still lots of regular boats on the water in Traverse City. Flocks of sailboats are always winging up and down the Bay in breezy weather, and there are plenty of powerboats, too – usually towing water-skiers or heading out to do a little fishing. Can you tell how eager I am to get back out on that water?